Successfully Added HK Warehouse Blackview BV6000S IP68 Smartphone - Android 6.0, Quad Core CPU, 2GB RAM, 4G, Dual SIM, NFC, OTG (Orange) to your Shopping Cart. With 4 core of processing and 2GB of RAM the Blackview BV6000S has plenty of potential to meet all your performance needs. Armed with a T720Mp Mali CPU you can enjoy the latest games and watch HD movies without suffering lag or delays. This Smartphone boats 16GB of storage and has a micro SD card slot for an extra 32GB of space so there's room for an extensive media library as well as all the games and apps you could need form the Google Play store. Proving the perfect control to all this power is an Android 6.0 operating system that efficiently manages the phones performance ensuring every ounce of power is available. This means the Blackview BV6000S can deliver fast load speeds and proficient multitasking letting you enjoy a seamless performance every time . No matter how demanding your life is it won't take a toll on this smartphone as its protected by an IP68 rating ensuring its impervious to dirt and water. 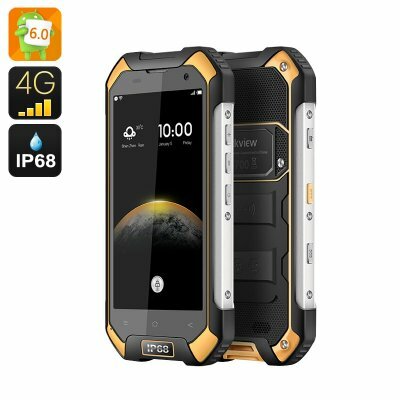 This shock proof phone can accompany you on the wildest of adventures and remain perfectly safe from the dangers of dust or water ingress. The 4.7 inch display has Gorilla Glass 3 protection and so scratches and drops aren't likely to stand in your way. At 4.7 inches the HD display on this Blackview phone is large enough to enjoy games and movies in great detail while remaining compact enough to slide in your pocket. This makes the phone truly portable despite its seriously capable protective shell. With its outdoor credentials including GPS and an atmospheric pressure sensors you can detect changes in the weather and navigate to safety before getting caught out in storms. Perfect for keeping you safe in the outdoors. The Blackview BV6000S has two SIM card slots that can each take advantage of the 4G connectivity. This means you can access the fastest cellular speeds available so streaming HD footage to your phone won't be an issue. You can have each SIM slot active at the same time to extend mobile coverage across a wider region, avoid roaming charges and easily manage both business and personal contacts all on the one device. With NFC supported you can leave the wallet at home and adopt contact payments with your mobile smart wallet, so that's one less thing to remember when heading out the door.